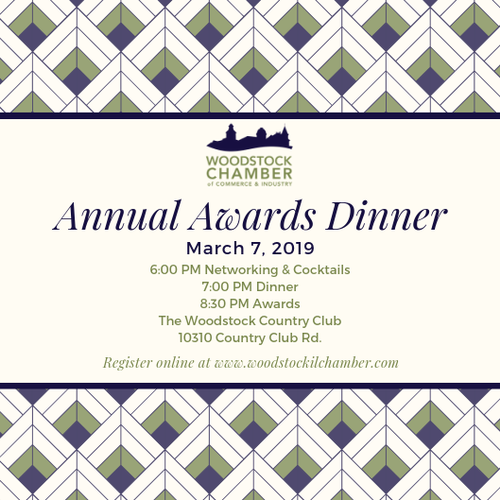 Please join us for our 74th Annual Awards Presentation and Dinner at the Woodstock Country Club on Thursday March 7, 2019. Become a sponsor of our annual event and get your business noticed! This is one of our largest fundraising events of the year so your sponsorship greatly benefits the Chamber and our future growth. 1.) EVENT SPONSOR (One - $500) receives; name and logo printed in prominent location on program ; logo included on powerpoint slide displayed throughout cocktails and dinner; company name mentioned in welcome and concluding announcements at event; listing as co-host of the event on Facebook; option to have a banner at the event; option to provide promotional items to be placed at each table for guests. 2.) AWARD SPONSOR (One - $350) receives; name and logo on award page of program; mention of sponsorship prior to commencement of awards presentations; logo on award related powerpoint slides; option to provide a promotional item to be placed at each table for guests. 4.) RAFFLE BASKET SPONSOR (10 - $100) receives; tent card with logo in front of basket on silent auction table; mention during the raffle basket winner announcements; Must donate a complete basket valued at $100 or provide a $100 cash donation and we will purchase and assemble it for you). Please drop donations off at the chamber office by February 15, 2019. Baskets can be dropped off at venue the evening of the event, but we ask that you guarantee this delivery if you commit to it. 5.) RAFFLE ITEM DONATIONS are also welcome (min $25 value per item). Please drop off at the Chamber office by March 4, 2019. Name will be listed on basket tent card where your donation was placed. 5.) RAFFLE ITEM DONATIONS are also welcome (min $25 value per item).